You may be at or near your healthy weight and still have stubborn pockets of fat that just won’t shrink despite your efforts with diet and exercise. 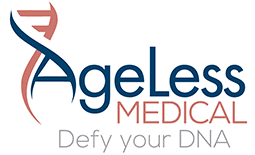 At AgeLess Medical in Cheyenne, Wyoming, advanced certified aesthetic injector and nurse practitioner Jill Girany, APRN, offers SculpSure® body contouring technology to help you lose fat permanently in your trouble zones. To learn how SculpSure can help you reach your physique goals, call the office or book an appointment online today. SculpSure is an advanced technology that uses targeted laser energy to destroy fat cells in problem areas. SculpSure’s laser energy penetrates your skin’s surface to disrupt the integrity of fat cells so they die off and are permanently removed from your body. The treatment is FDA-cleared and completely noninvasive, so it involves no sutures, blood loss, or incisions. Jill Girany discusses your body contouring goals to create a customized SculpSure treatment plan to help achieve them. SculpSure treatment is not painful, and most patients tolerate it quite well. Expect to feel warmth and tingling sensations during the 25-minute procedure. Each SculpSure treatment can reduce up to 24% of fat cells in the treated area. In many cases, patients choose to have several sessions to get the best results. Jill Girany discusses with you how many sessions are needed based on your goals. The fat reduction results of SculpSure may begin to appear in about six weeks, but you’ll notice the most dramatic changes after 12 weeks. It takes time for the fat cells to die and for your body to then eliminate them through your lymphatic system. Does SculpSure require downtime following treatment? SculpSure treatments are noninvasive and require absolutely no downtime. You can go right back to all your daily activities after a session. You may have some redness in the treatment areas, but it usually resolves in just a few hours. SculpSure permanently destroys fat cells in treated areas. This means they can’t plump back up to add volume to these trouble areas. With conventional diet and exercise, fat cells only shrink, so when you don’t eat right or exercise, they have the potential to expand. The permanent removal of fat is what makes SculpSure such a revolutionary method of body contouring. To learn more about SculpSure body contouring, call AgeLess Medical or book an appointment online today.